Day 1: Transfer Santiago Hotel / Airport - Flight to Castro (Chiloé) - Transfer Airport / Hotel – PM HD City Tour Castro (private service). Our driver will transfer you to the Airport to take your flight. Our local guide will wait you at airport of Chiloé for to transfer you to your hotel in Castro. At afternoon you will have a tour around the city of Castro, Capital of Chiloe Island, visiting the main attractions: Square, San Francisco Church (UNESCO), Palafitos (stilt houses), lookouts and market. Day 2: Full Day Chiloé National Park. Located on the west coast of Chiloe´s Great Island, Chiloé National Park protects an ecosystem of high ecological value, including areas of evergreen forest and peat bogs. Among the most representative species of flora we find the ancient Alerces, the Canelo, sacred tree of the Mapuche people, the Guaitecas Cypress, prized for its valuable wood, Tepú, which stains the water a reddish color, and many more. Among the fauna we find Chilote fox or Darwins Fox, named after the illustrious naturalist creator of the evolution theory, as well as the Darwins Frog, which is close to extinction, the Pudú, world's smallest deer, and easier to observe are hundreds of species of birds, among which are Kingfishers, Magellanic Woodpecker, beautiful Chucao and many more. 2 hour hike along “El Tepual” trail of low difficulty and great biological richness. Cultural tour in which we cross Dalcahue Channel to the legendary Quinchao Island, visiting the villages of Curaco de Velez, Achao and Villa Quinchao. We drive on secondary roads stoping at viewpoints and observing the channels of the inland sea and wetlands that are home to several species of birds. Town of Dalcahue is also visited with its Craft Market, Patrimonial Church and “Cocinerias” wich are a traditional food court. Visit the oldest church of the archipelago: Nuestra Señora Loreto of Achao, constructed in century XVIII. Day 4: Half Day Puñihuil Penguin Colonies (with luggage) – Transfer to Puerto Montt and Puerto Varas. Transfer to the north side of Chiloe Island, stopping on Ancud City where we visit an old Spanish fort and the Foundation of Patrimonial Churches in Chiloe. Then continue to the Pacific up to Puñihuil Natural Monument, where 3 islets are home to an interesting variety of marine wildlife, including 2 species of penguins that come to nest every summer: Magellanic and Humboldt Penguins. At afternoon you will be transfer to your hotel in Puerto Varas. Day 5: Full Day Osorno volcano, Petrohue waterfalls and Todos los Santos lake. This adventure will take you to see this active volcano, renowned for its perfect formation, and the famous Petrohué Waterfalls, both important landmarks in Southern Chile. A lake originating from a glacier and an active volcano, famous for its perfectly shaped crater, are two of the attractions you can see with this package. The tour starts on the southern shores of the Llanquihue Lake, where you will learn about the German settlers and agriculture in the zone. Once in the Vicente Pérez Rosales National Park, you will be able to enjoy the imposing Petrohué Waterfalls, which stun visitors with their turquoise waters. From there, we will go on to the origin of the Petrohué River, Todos los Santos Lake, where we will visit some of its sleepy beaches. By then, we will be at the foot of the Osorno Volcano to enjoy a lunch in the village of Ensenada, before continuing up to the ski resort on the volcano. On route, you will be stunned by the panoramic views of the Petrohué River valley and the beautiful Llanquihue Lake. Lodging at Puerto Varas. Day 6-8: Transfer Hotel / Puerto Montt. Ferry Boat to Puerto Natales.. Patagonian Fjords Route. Depending on your boarding time, you will be transfer from your hotel to the Ferry Boat, to enjoy this amazing sailing experience through the Chilean Fjords full of flora and maritime fauna. Our local driver will wait for you on the maritime terminal to transfer you to your hotel. There you can make the check in, rest and go out to discover the Puerto Natales City by yourself. The excursion begins with a visit to Milodón cave, a remarkable cavern of 200 meters long, 30 meters high and 80 meters wide, it´s located 25 km from Puerto Natales. A half-hour walk will take us into the cave, known for the discovery of fresh skin and bones from a prehistoric species of giant sloth, the milodón. There have also been found remains of other extinct animals, such as dwarf horse, bear, panther and saber-toothed tiger. 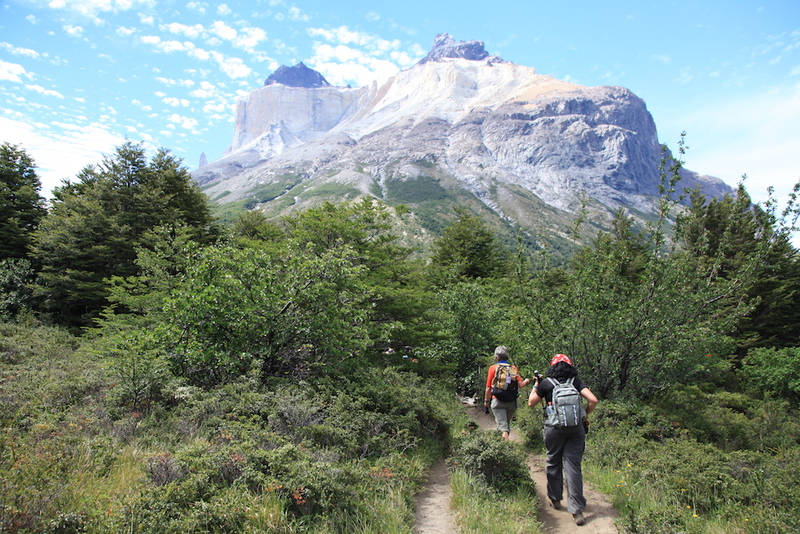 We continue towards Torres del Paine crossing Numerous Estancias and a landscape that goes from the steepy to the deciduous forest. Along the way it is possible to see local fauna including the South American ostrich and the guanaco, a wild camelid. Torres del Paine is famous for the massifs that give it’s name, giant granite modeled by the force of glacial ice. After entering in the park we discover a series of intense colored lagoons, mountains covered with ice and abundant local fauna. Then you will stop for a 15-minute walk to the Salto Grande on the Paine River. After lunch you will continue to Lake Gray, where you will go for a walk leading to a panoramic point: from there you can see the icebergs and the glacier of the same name. Subsequently, the same route undertakes the return to Puerto Natales, or by the path that borders the lakes Toro, Porteño and Sofia. Recommendation: You can go with your box lunch or buy lunch on the spot. Day 11: Sailing Serrano and Balmaceda Glaciers. Regular Sevices. This spectacular trip is a must if you visit the city of Puerto Natales. We invite you to discover the incredible world of the fjords. Sailing by boat to the Balmaceda and Serrano glaciers, through Ultima Esperanza Fjord, sighting of beautiful mountains, waterfalls, estancias and Patagonian avifauna. Visit Balmaceda Glacier and hike through leafy coihues and ñirres forest up to the foot of the Serrano Glacier. The tour ends with a lunch, where you can taste a typical dish from the area, the Magellanic lamb, before going back to Puerto Natales. Day 12: Transfer Puerto Natales Hotel / Calafate Hotel. At morning our guide will pick you up to transfer you to the border with Argentina. There, other transport and local guide will wait for you to transfer you to your hotel in Calafate. Free afternoon to discover Calafate by yourself. Day 13: Full Day Perito Moreno Glacier. Regular Services. Early in the morning your transfer will pick you up and will drive you to the Perito Moreno glacier, a very active glacier on the south arm of Lake Argentino. One of the most traditional excursions to visit the Perito Moreno Glacier consists of navigating on a catamaran up to the highest walls and making a stop there to admire its grandeur. The nautical safari, as other tours, waits for passengers to get on board at the bay called Bajo las Sombras (Under the Shadows). One of the most outstanding excursions available is hiking on the glacier with the aid of crampons to walk on the Perito Moreno itself: a memorable experience. But the catamaran is an adventure with capital letters. At its own pace, slow but steady, the ice floes that float adrift on the surface of Lake Argentino are captured by the cameras coverting to a souvenir from this tour. The catamaran gets as close as possible to the point where the glacier meets solid ground and the famous ice bridge is formed. Every now and then, this bridge collapses and this is known as “the rupture”. In fact, that’s not such a rupture; the glacier is constantly breaking off. As you approached Canal de los Témpanos (the Channel of the Ice Floes), the boat stops in front of the glacier and started to tour along its front. Many passengers are on deck trying to capture this show starred by nature with photographic cameras and camcorders. Silence and expectation prevailed. Nobody wants to miss some great calving event and the truth is that this tour guarantees astonishing scenes. Here you will proceed with the group to the balconies viewing areas for approximately 45 minutes of viewing time. Later you return to spend the night in the town of Calafate. Day 14: Transfer Hotel / Calafate Airport. Flight to Ushuaia. Transfer Airport / Hotel in Ushuaia. Depending on your boarding time, you will be transfered from your hotel to the Calafate airport in order to take your flight to Ushuaia. At your arrival in Ushuaia, our local driver will wait for you for to transfer to your hotel. After the check in, you can take your lunch and then visit the main spots of the city in a 90 minutes City Tour with a local guide. Day 15-18 : Half Day Tierra del Fuego National Park. Transfer to Ushuaia maritimal terminal. Created in 1960 to protect the southernmost forests of the Beagle Channel, Tierra del Fuego National Park covers an área of 69,000 hectares. You will have a customized experience in private services to go at your own rhythm to unexplored trails, reaching hidden corners in the woods. You take National Route 3 from Ushuaia and stop at a Panoramic Point in the Beagle Channel. Then you get to Tierra del Fuego National Park to start the treck. After walking half a day, you get a good idea about the uniqueness of this particular ecosystem. Mountain ranges cross the park dividing it into valleys which makes the access difficult to reach. Unlike other Andean-Patagonian parks, it has forests by the seashore, six kilometers along the Beagle Channel: Lapataia Bay, meaning “woody bay” or “bay of wood” in the Yámana tongue. After the tour and lunch, you will be transfered to the maritime terminal in order to take the Australis Cruiser Ship in a Patagonia Explorers Route 5d/4n. You will enjoy the best of the extreme southern landscapes. Day 19: Arrival in Punta Arenas – Transfer to Hotel. This day our local driver will be waiting for you at the maritime terminal to transfer you to your hotel. The Colorful Punta Arenas is the southern most continental city in the world, also known as “the end of the world”. Its location along the Magellan Strait, places this city as a historic-cultural attraction for being the main shipping port between the Pacific and Atlantic Oceans. Nowadays it maintains an European architectural style, represented in its neo-classical buildings, and its broad tree-lined streets. The pick up will be at your hotel at 10:00 a.m, where we will drive through the ¨Plazas de Armas¨ (Main Square). There, you will see the Bronze Monument called ¨The Patagon Indian¨ dedicated to Hernando de Magallanes. Continuing with our journey, you will visit ¨Cerro de la Cruz. It´s a beautiful viewpoint of the city, where you will also be able to see the Strait of Magellan. Then, you will drive to Municipal Cemetery, with its beautiful gardens and mausoleums. To continue with the City Tour, you will Access to the ¨Ovejero Monument¨ where you can take pictures. Then, you will visit the Nao Victoria museum where you can appreciate an attractive and interactive real scale Boat and live the experience of the expedition led by “Hernando de Magallanes”. Finally, you will visit the seafront of the City where you will see the replica of the ¨Goleta Ancud”. After the City tour and lunch, you can return to the hotel to have a rest and continue discovering the city and its markets by yourself. You will be able to enjoy a nice and comfortable place, connected with Navigation through the Strait of Magellan. The King Penguin is the second largest out of 18 penguin species around the world. The pick up time at your hotel will be between 07:30 and 08:00 am to go to the “Tres Puentes terminal”. At approximately 09:00 a.m, we will begin 2 hours of crossing through the strait of Magellan. As soon as you arrive on Bahia Chilota village, you will have a 20 minutes driving to go and visit one of the most southern city in Chile, Porvenir”. Upon Arrival, you will visit the Museum Fernando Cordero and the Selknam Square. Then around 01:00 p.m, you will stop in a small and cheap restaurant for lunch. Continuing with the trip, you will go to the Bahia Inutil to meet an incredible colony ¨The king Penguing Park”. After the visit, you will begin the trip back to Punta Delgada Area, around 20 minutes, and finally you will visit San Gregorio Residence, which is the last stop. So you will arrive around 09:30 P.M in Punta Arenas. Day 22: Transfer Hotel / Punta Arenas Airport – Flight to Santiago de Chile – Transfer to Santiago Hotel. Depending on your flight, our local driver will pick you up to go to the airport in order to take your flight to Santiago de Chile. There you can take your international flight or be transferred to your Hotel.